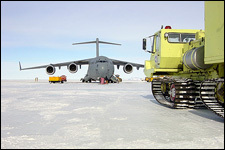 The Antarctic Fire Department can be reached by contacting department administration at Lockheed Martin's Antarctic Support Contract Division. Please limit inquiries to those about the department that are business/job-related in nature and are not covered on this website. If you are interested in applying for a position with the department, search for available openings at https://www.pae.com/career. Once the department has received your application from Human Resources department, and you meet minimum qualifications, a department representative will contact you. Lockheed Martin does not accept hardcopy resumes - this includes the Antarctic Fire Department. To be considered for an open position you must apply through https://www.pae.com/career. The Antarctic Fire Department respects the tradition of "trading patches" and/or t-shirts between individuals in the fire service. However, this practice is carried out solely between individuals. Requests by unknown parties for trading or purchasing official emergency services identification/uniforms represents a US Department of Homeland Security risk both at home and abroad. As such, the department administration will not respond to or honor requests for patches or t-shirts via business communication methods. The Antarctic Fire Department website is informational in nature, and does not represent an official website by the United States Antarctic Program, the National Science Foundation, Lockheed Martin ASC, PAE Group, or any other entity. The information on the website is maintained by White Wonder Studios, which is a company owned by a former Antarctic Fire Department firefighter. ATTENTION: Do not contact White Wonder Studios with questions related to employment, your messages will not receive a response for failing to follow directions to apply, which are outlined on this website. Employment related inquiries must be directed to PAE Group. Please understand that the dynamics of the AFD and USAP are constantly changing, and that information or pictures on this website may not be up-to-date. If you are a USAP contract employee, grantee, or AFD firefighter, and have more updated information or pictures that you would like to contribute to help with the maintenance of this site, please send a message to White Wonder Studios.